We simplify the times table into small, brain-friendly groups! How does Factivation!® make Multiplication facts so simple for students? It starts with condensing the times table into logical, manageable groups. Most Factivation!® lessons only contain three focus facts! 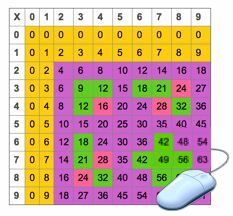 Let’s take a quick trip down memory lane: Think back to your elementary days when YOU were learning the (often dreaded) times tables. Perhaps you had a teacher hand you a stack of 100 flashcards to practice, or maybe she simply gave you a Multiplication chart to study. It’s possible that you were taught in sequential order. “This week we’ll be learning our Sixes facts, class.” You felt overwhelmed believing you had 10 new facts to learn…6×0, 6×1, 6×2, 6×3, 6×4, 6×5, 6×6, 6×7, 6×8, and 6×9. And, try as you did, you simply could not remember the product of 6×8! Had you known the very simple “Half-Whole” trick; however, you could have easily applied it to 6×4, 6×6, and 6×8. (That’s Lesson 5: Sixes- Check it out now!) The “7 Beetles” chant could have provided a fun way to remember 6×7 and the “6 and 3” chant would have been your class’ favorite to recite when your teacher was using Multiplication chants multiple times daily as your class attention getters. (Learn these chants in the “Fun Facts” lessons: Lesson 6 & Lesson 7!) That would only leave 6×0, 6X1, 6X2, 6X5, and 6X9 which you already knew, thanks to short daily doses of the commutative property. Factivation!® simplifies the learning of all facts by use of strategy and small, brain-friendly groups.